WEST Coast’s horror run of injuries to key defenders has continued with Will Schofield no certainty to be fit for the first week of the finals due to a hamstring injury. That is the view of leading medico Dr Peter Larkins, who believes Schofield is set to be sidelined for three weeks after injuring his left hamstring in Sunday’s derby showdown with Fremantle. 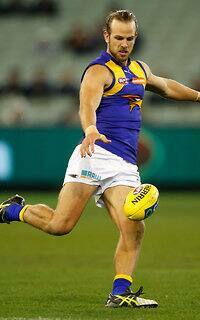 “West Coast cannot take a trick with their tall defenders,” Larkins said. “He’s got a left hamstring injury and he’ll get scans done on that to see how long it’ll be. “I wouldn’t expect he’s going to play in the next two, if not three, matches. The Eagles are hoping to have Jeremy McGovern, who is also dealing with a hamstring issue, back before their qualifying final. Another finals-bound team has their own injury worries, with the Sydney Swans counting the cost of Friday night’s win over Collingwood. The Swans are yet to rule star midfielder Luke Parker out for the season but he is still expected to miss up to five weeks after undergoing surgery on a fractured fibula on Sunday. Larkins believes Parker will be racing the clock to get back this season, even if the Swans progress deep into the finals. Star forward Lance Franklin has also been classed as a “50/50” prospect to play against Greater Western Sydney as he continues to deal with a lingering back issue. “He’s going slower than they expected. He wasn’t able to do as much training as they would have liked last week and didn’t play,” Larkins said. Swans defender Jeremy Laidler is set to be ruled out of the clash with GWS with back-related hamstring tightness. Meanwhile, Larkins expects Gary Rohan to undergo a fitness test later in the week after he jarred his knee against the Pies. Geelong’s Mitch Duncan is also in doubt for Saturday night’s game against St Kilda due to a calf strain. Duncan was a late withdrawal for the game against the Hawks and Larkins says the Cat faces an uphill battle to be fit for the game against the Saints. “There’s an outside chance that Mitch Duncan will get back. “He’s got a low-grade soleus strain, which is the main calf muscle. However the news is better for veteran James Kelly, whose ankle injury is not as bad as first feared, according to Larkins. Kelly sustained a serious ankle injury back in round 11 against Port Adelaide, causing him to miss three weeks. “There’s still a chance that he’ll need another week off, depending on how sore he is,” Larkins said. “I’m probably not expecting him to miss. He knows his body well enough and, with strapping, they’ll test him later in the week. The Suns also have their injury concerns with big men Charlie Dixon (ankle) and Tom Nicholls (knee) set to miss games. The Suns are awaiting the results of scans on Nicholls’ knee, with Larkins anticipating he may have done damage to his posterior cruciate ligament, which would rule him out for the rest of the season. Dixon, who played out Sunday’s game against Richmond under significant duress, is not expected to be fit for Saturday’s clash with Essendon. – Greater Western Sydney co-captain Phil Davis is likely to be ruled out for the year with a hamstring injury. – Essendon ruckman Jonathan Giles could also be out for the season due to damage to the surface of the bone in his knee or, potential meniscus damage. – He would be very surprised if West Coast had put Jamie Cripps back on the field after being diagnosed with a fractured jaw. – Eagles ruckman Scott Lycett is having scans on a potential posterior cruciate ligament injury in his knee that could impact on his ability to play in the coming weeks.